Steph tells Lib that she has been thinking about home and when Lib, obviously not believing her explanation, asks for the real reason, Steph fesses up and says that she can't go home now because she wants to prove that she can have a life outside Ramsay St. Lib tells her that's rubbish, and that everyone knows that Steph can make it anywhere she wants to. Steph then tells her she feels like a wimp. Lib asks her if it's wimpy to change her mind, to admit she made a mistake and go after what she really wants. Steph asks her to not give a 'Libby Kennedy Lecture', and Lib tells her there's no extra charge, but agrees anyway. Joe is peeling a few 'spuds' when Valda comes in and tells him he should've left the potatoes for her to peel. But he tells her he can peel them himself and that she is due at the pub anyway. Valda tells him thst she is, but she wants to have a quick word with him first. She then brings up his fear of flying and an unhappy Joe asks her who told her about it. Valda tells him it's nothing to be ashamed of and Joe quickly says he isn't ashamed. She tells him that she has a brilliant idea - She could use the ticket instead. Joe tells her he kind of wanted to see Flick himself, and Valda tells him he doesn't need to decide now. He and Lyn can talk about it and she leaves telling him that the offer is there. Just as Valda opens the door, Karl hurtles through and Valda screams. Valda tells him that Joe is in the kitchen. He walks through and tells Joe that they should have a chat about Joe's fear of flying. Max is reading a postcard from Steph to Summer. We can hear Steph's voice as he reads it. Steph's postcard has an abridged version of the rafting mishap and asks how things are in Ramsay Street. She then finishes off with 'I miss you all. Love Steph' And Max says he misses her too just as Boyd walks in and asks whether Max has started talking to himself again. Max casually throws the postcard onto the side table as he walks into the kitchen to start on dinner, whilst making small talk. Boyd picks up the postcard and then looks seriously, in the direction of the kitchen. Joe is pounding something (I think it's meat) and Karl is telling him to just admit he has a problem with flying. Joe's told Karl about Valda's generous offered and he's considering it even though he knows she's just fishing for a free holiday. But he says that way he'll get her out of his hair for a while as well as a first hand report on Flick. Karl tries to make Joe feel better by telling him that 1 in 6 people have a fear of flying and Joe asks him to cut the onions. Karl also tells him that we all have a phobia of something. Joe doesn't find comfort in this, but Karl tells him he's not alone in his fear of flying and there's nothing to be embarrassed about. Joe then kind of shouts that he is not embarrassed, and when Karl asks him what the problem is, he says he's scared. Karl starts telling Joe about the various options he can use to get over his fear, the whole time he is still cutting the onions and he's starting to sniffle and wipes his eyes with the back of his hands. When Joe tells him that none of the techniques (like meditation etc) work, Karl, who is practically crying now, tells him to give it a go and that he'll help Joe as well. Lou is one the phone but he can barely hear anything with the plates being smashed on the floor. He calls Connor over and offers him something to try (I can't hear what he says). Connor tries some and tells Lou it's tasty. Valda then comes out and starts breaking more plates. Lou tells Connor there's an easier way to make money and he has a job for him first thing in the morning. Max and Boyd are eating when Summer comes home. Isabella's dad dropped her off. Max tells her there's a postcard for her and Summer finds it and then starts reading it aloud. Boyd tells her to read it to herself because there might be something private. Summer tells him there isn't and then mentions that there is no mention of Alex. Max tells her there isn't much room on postcards and goes to get Summer some ice cream. Summer sits down next to Boyd and asks him if something is wrong with Max. He says Max is 'cool' and asks her if she wants to watch the new cop show. Joe is having a dream about planes (I think at the end one is crashing) and wakes up rather startled just as Valda comes into the house. She asks him if he's OK and he just tells her it was a dream. A nightmare. Valda asks if he wants to talk about it and Joe gets up, saying he doesn't. He walks into the kitchen and Valda follows him saying she knows what it was about. He was in a plane and it was crashing. Valda tells him the best way to stop having the dreams is to let her go to New York, and that it's only a hop, skip and a jump away from Montreal and Andreas. Joe then tells her what he and Flick are going to do when he goes to New York, emphasising that it will be just himself and Flick. And then he leaves Valda looking very unimpressed with losing her free ticket. Boyd comes and gives Max a cup of tea. Max feels he should be in bed, but Boyd asks if it's still Ok to go to the after- formal party. Max wants to check all the 'parent stuff' supervision etc so Boyd gives him the invite. Since Max is a little subdued, Boyd asks if he's missing Steph. Max replies that he is a bit. Boyd goes on to say that he was pretty childish when they went out and perhaps if he had been nicer, she wouldn't have left. 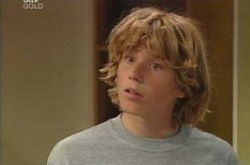 Max assures him that Steph always wanted to do the trip, but Boyd promises that if Max meets someone else he likes, he'll try to be more mature about it. Steph's 'playing ball' while holding Ben and telling him about his father. She's not sure it's OK when Libby arrives. But Libby says she talks to him about his father all the time. He was a good catcher, as Steph said - and good at just about everything. Libby asks if Steph has made a decision - she has, that she's not going to travel with Alex, but she's not going home just yet. Connor brings in an enormous box of stuff he's collected for Lou. Lou's very pleased until he opens it and finds that instead of ducks for the Lassiter's bathrooms, he has dozens of little furry kangaroos. He thinks it's the wrong shipment, but Connor's sure it isn't. Lou asks how he's going to get rid of all these. When Boyd comes in, Summer greets him, crowing 'you're so not going to like this'. 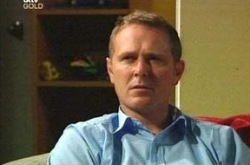 Boyd plays innocent until Max is forced to spell out for him that he's called Tyson's mum (at whose house the after-party's due to be held) and found out that they know nothing about the party and will be away for that weekend. Summer tries to lecture max on social death as a consequence of your parent ringing the others and Boyd points out that max wouldn't have allowed him to go if he'd known it was unsupervised. Max says he's dead right and is very lucky that he's not also banned from going to the formal. Lou has rung the docks only to find them closed. 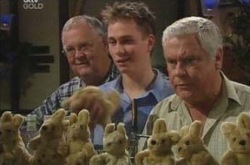 Valda tells him of an idea - to make the following week 'Australian week' - seafood, oysters prawns etc While Harold and Valda list Australian gourmet dishes, Connor keeps repeating his plea for meat until he notices that a kangaroo's stitching's dodgy. 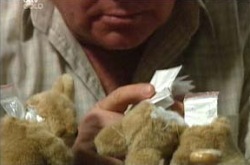 The kangaroo's head comes off very easily, disclosing a little packet of white powder, which Lou holds up to examine. Boyd's trying on a very small school uniform , his old one from Eden Hills, because he needs to convince Heather's parents that he's in her class. Summer's suggestions are no help and he complains again about max ringing Tyson's parents and his whole life in general. Summer tries to convince him that it's a seven-day wonder - he'll be Ok because he's basically a nice person. She tells him she overheard what he said to Max about Steph. He says Steph's ages away and isn't coming back - if she was across the road he wouldn't be anywhere near as supportive. Summer holds out a hand and says 'Dad' , holds the other 'Steph' and puts them together. 'It's fate and there's nothing you can do about it. I'm right - you'll see'. Boyd sighs. 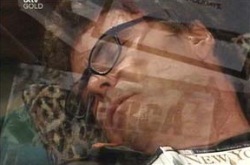 Joe's on the lounge with Karl over him trying to get him to do a visualisation relaxation exercise, but he's cynical. Joe describes his imaginary room as asked but there's a big door-knock and he wants to know who it is. So they abandon that one. Karl tries to get him to visualise the excitement of going on holiday as a child. Joe blocks it 'we couldn't afford it' and Karl sighs and stops. Valda wants Lou and Connor to sneak the boxes back to the docks. Lou wants to deny that he ever got them, but Max points out that he shouldn't start telling lies to the police. 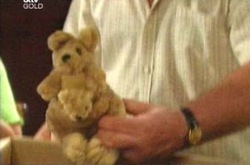 Lou admits that Harold and Max are right and is about to call the police when Connor rushes in, saying 'It's happened! He's here! There's a man at the bar and he's big and he's bald and he's angry and he's looking for you'. Lou just looks around at his friends.